It stretches all of Pinellas County and hundreds of people weighed in on how they think Alternate 19 can be made safer for everyone. PINELLAS COUNTY, Fla. — It stretches all of Pinellas County and hundreds of people weighed in on how they think Alternate 19 can be made safer for everyone. 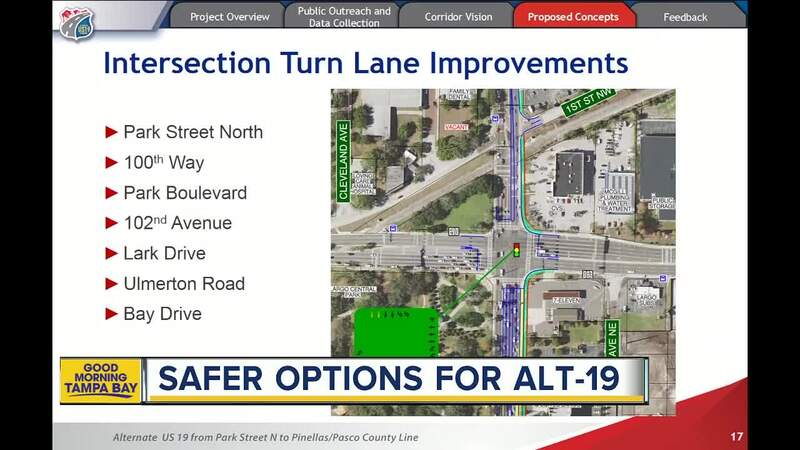 On Wednesday, officials with the Florida Department of Transportation and Forward Pinellas presented findings from an 18-month long study to a group of people in Dunedin. 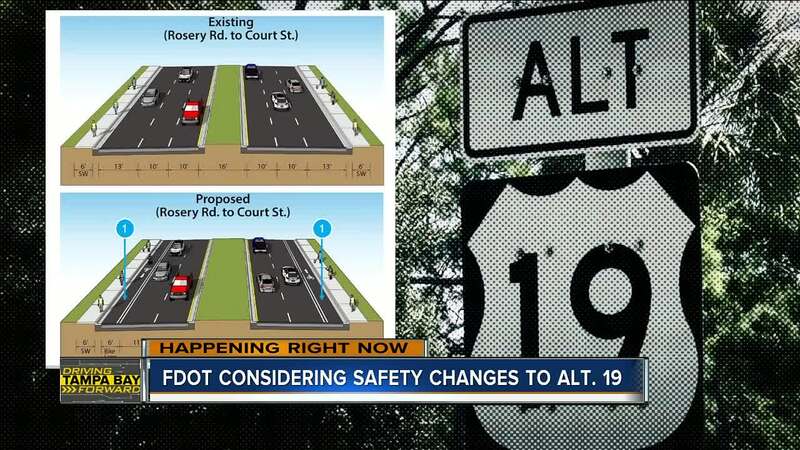 The goal of the study was to move people up, down and across Alt 19 safely. "I definitely think people are going faster than the posted speed limit,” said Brianna Odom, a mother of two who frequently goes to Josiah Cephas Weaver Park in Dunedin. She says trying to cross the two-lane road in that area can be challenging. "Especially when I have a stroller and I’m holding my daughter's hand or just trying to cross the road and people just keep driving,” she said. She’d like to see more flashing crosswalks on the road. "It’s an interesting corridor because it’s trying to do a lot of things,” said White Blanton, the Executive Director of Forward Pinellas. Some of the ideas they’re throwing around — changing certain signalized intersections into round-a-bouts and replacing some travel lanes with bike lanes and wider medians. In Dunedin, near the Marina, they’re suggesting two round-a-bouts that would flow into each other. This plan would get rid of the need for a light where Alt.19 meets Main street. Officials are excited about the reaction from the public. "Whether they think it’s feasible, what ideas they like and what ideas they don’t,” said Blanton. FDOT says there is funding for design for these areas in the fiscal year 2023.